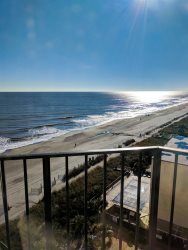 Ocean View One Bedroom Condo-Sleeps 4! Property Size 500 sq. ft. The Ocean View One Bedroom Condo is located at the BlueWater Resort in Myrtle Beach! This unit has a full kitchen and one full bathroom. It comfortably sleeps 4 with 2 queen beds in the bedroom! Please note: The BlueWater Resort is currently completing an exterior project that will take place until the end of April 2019. Our balcony is not complete and you will not have access to it and there could be noise and odors that affect your stay. We apologize for any inconvenience but because you are being forewarned, there will be no refunds given. Our prices are already discounted due to this. You can enjoy the outdoor pool, indoor pool, lazy river or a kiddie pool for the kids! Free wifi is included throughout the resort. On site, we also have the Palm's Restaurant where you can dine on delicious entrees while overlooking the swimming pool and there is also an oceanfront beach bar, Nassau Ned’s, where you can enjoy live entertainment! **Unfortunately our guests do not have access to the on site fitness center. The BlueWater resort is located in central Myrtle Beach and just minutes away from Myrtle Beach's most loved attractions.